I’m taking some time off over Easter, in the hope that Spring will finally appear. In the meantime here’s the famous Intermezzo from the Opera Cavalleria Rusticana by Pietro Mascagni. The conductor is the venerable Georges Prêtre, with the Orchestre National de France. 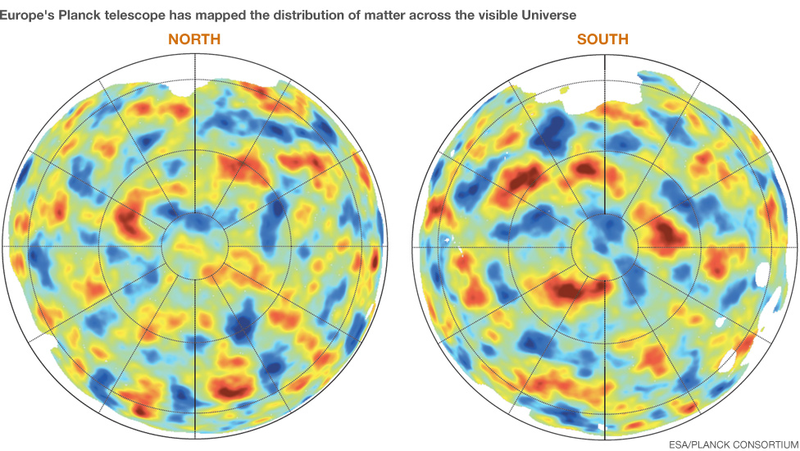 Although these images were obtained using measurements of the cosmic microwave background made by Planck, they are not themselves maps of the radiation field itself. As photons produced in the early Universe travel through the Universe towards the observer, they are deflected by the gravitational field of intervening clumps of matter; this is called gravitational lensing. With a bit of effort this effect can be “inverted” to reveal the distribution of matter traversed by CMB photons, or at least a projection of that distribution along the line of sight. The good thing about this is that the maps show all the matter (through its gravitational effects) not just the luminous part that might be seen in a galaxy surveys, so they might provide more direct ways of testing cosmological theories. As well as all the University of Sussex business I’ve been having to take care of over the last couple of months or so, I’ve also been trying to find time to keep up with the new round of applications to the Astronomy Grants Panel of the Science and Technology Facilities Council. I had originally thought that the 2012/13 round would be the last one on which I served, but I must have misbehaved in some way because it appears that my sentence has been extended for another year. The latest duty required of panel members has been to assign reviewers to the new proposals, which means reading each case and trying to think of appropriate experts to assess them in detail. Normal procedure is to contact such people informally in the first instance, with Swindon Office following up by sending the actual documents if and only if they agree. fortunately, most people out there in astronomyland are very public spirited and it’s usually not that difficult to find willing reviewers. In the course of contacting potential referees this round I had a couple of replies from people who were apparently already considering the possibility of volunteering to be on the panel next year and who therefore asked me what it would be like. I thought I’d make a few comments here in case anyone reading this blog has toyed with similar thoughts. Basically, my view is that the AGP is extremely hard but also extremely interesting work, and it’s also the chance to work with a very friendly and cooperative group of people. From that point of view I think it’s well worth doing. Plus, of course, the wider the range of people who participate in panel work the fairer it is likely to be. In fact, if it weren’t for the friendly company the three-day meetings in Swindon during which the final recommendations are drawn up would be truly horrendous. These meetings are extremely pressured, by the way. If I recall correctly the volume of grants to get through corresponds to about £10,000 per minute of discussion time. Anyway, if you’re wondering whether to put yourself forward for nomination as a member of the AGP then please do, because the process needs to engage the community it tries to serve. If you do join up, though, just be prepared to suffer a few of the odd slings and arrows. As for me, this is definitely my last year. I have a few enough friends already, and I can’t afford to lose any more. Frustrated at my ongoing indisposition – I had to miss today’s Admissions Day at Sussex University, which has put me in a very bad mood – I’ve decided to deliver a short rant about widening participation. WP is the name given to schemes to open up access to higher education to students from less advantaged backgrounds. An excellent idea, of course. The problem is that, despite pressure from the relevant quango (OFFA) most self-styled leading universities, especially those in the Russell Group, have consistently failed to widen participation to any significant extent. Why is this? The easy answer is that universities have to take students who are adequately prepared for undergraduate studies, which means selecting on the basis of A-level grades, which means students from private schools have an advantage. The problem with this argument is that, at least in Physics and Mathematics, I don’t think A-levels are a reliable indicator of aptitude for undergraduate study at all. If I had my way we wouldn’t use A-levels at all. Unfortunately we’re stuck with the current, unfair, system because any “leading” university that takes a large number of students with weak A-levels (possibly through a Foundation Programme) will be penalised in the league tables for not being selective enough. Moreover, the Government’s decision to lift the cap on places for students with AAB or better, means that recruiting students with top A-level grades is potentially the most lucrative strategy. That the system doesn’t work the way it is supposed to is obvious. If you don’t agree, then ask yourself why it’s not the case that virtually all Oxbridge students get first class degrees, when they admit only A*/A students? Things won’t improve until we abandon the obsession with A-level tariff points and find a way of assessing intrinsic ability.